Over a billion people watched this moment, live. When 33 Chilean miners were rescued from a collapsed mine in 2010, more than a billion people tuned in to watch the live broadcast on television. The story, which inspired a multimillion dollar Hollywood film starring Antonio Banderas and Juliette Binoche among others, is now in the midst of recruiting stunt doubles amid an alleged dispute over the contract in which the survivors signed away their life rights. Local newspaper La Tercera (in Spanish) reports several of the men, including Luis Urzúa, the group foreman at the time of the accident, claim they were tricked out of royalties by lawyers and abandoned by the Chilean justice system. 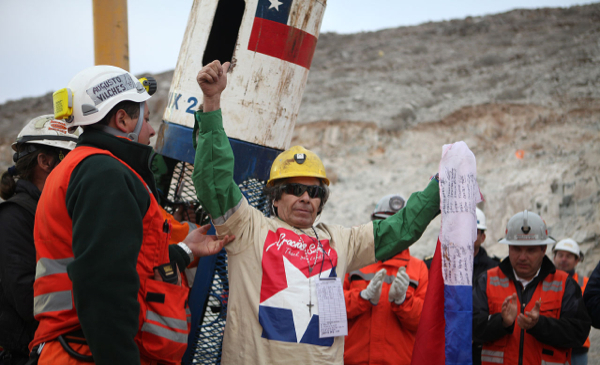 So far, compensation for the former employees has included a $10,000 gift each from Chilean billionaire Leonardo Farkas, and about $450 for 14 of the miners, in the form of a lifetime monthly pension. Last year, project owners Alejandro Bohn and Marcelo Kemmeny were billed with 25% of the expenses for the rescue operation, which cost the government about $22 million. The Guardian reported at the time the miners had never opposed the making of the movie, but were definitively against what happened with their contracts, how they were developed and how they were at that point (Nov. 2013). The movie, currently being shot in Bogatá, Colombia, is about to begin the Chilean leg of the filming. La Tercera reports that, over the weekend, over 2,300 people showed up hoping to be chosen to be one of the 1,000 background actors and extras needed to replicate Camp Hope in the Atacama Desert. A spokesman for the US film production told MINING.com the movie is, ultimately, about the triumph of the human spirit. "It is also a story about courage for those who did not give up during the 69-day ordeal, ultimately emerging as heroes (the miners as well as their rescuers)," he said in an e-mail. He added that, while they are making an entertaining film, they also hope to inform and educate. "It’s only with the world’s support and understanding that certain situations can change. While mine workers around the world organize to defend their rights and protect their health and safety in the workplace, the painful fact is that miners, like the minerals they produce, are still treated as a disposable resource," he concluded.